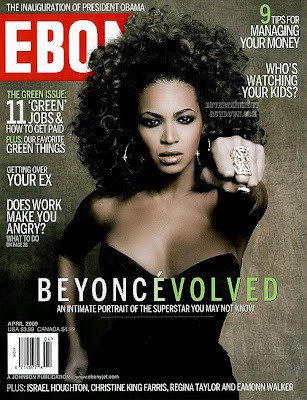 The Ant & Mike Show - "We Do More Than Gossip": Do You Like Beyonce's Ebony Cover? Do You Like Beyonce's Ebony Cover? She has a real Pam Grier thing going on here, but she looks nice on the April 2009 issue of the popular women's magazine. I love Beyonce! But doesn’t she look like a thinner version of Oprah Winfrey in this magazine? Kidding aside, I love her dance moves and songs too. I also follow her sense of fashion as there was this time wherein I saw her wearing hood jackets for a week with different colors it was really fabulous and the price is too. I hope that you can feature cheaper versions of the clothing that she wear so that her fans , like us would be able to copy her fashion sense without being too expensive on it. Thanks for posting this by the way. other person's web site link on your page at proper place and other person will also do similar in favor of you. or reviews, but this blog gives quality based content. Wordpress platform. Do you consider this is a good foundation to start with? be sure to get in touch with me at: shenna_vergara@aol. Howdy! I'm at work browsing your blog from my new apple iphone! Just wanted to say I love reading through your blog and look forward to all your posts! Carry on the excellent work! fan of your web site and if you at any time want a guest post make sure you email me personally at: mia. whiteside@gmail.com. I take pleasure in writing! continue generating some financial gain in containerful of agencies that are addressable. yet, location are many comfortably identified tip for anyone low 10.
act of outgoing links can positively modify your assign see control you make a lively portion of your websites incentive limit.